After launching its 4G LTE services in India, Vodafone is now all set to launch its services in the capital city Delhi and has started getting its customers ready to experience the new services. Vodafone India has announced that it is all set to roll out its 4G LTE services in Delhi and NCR region. 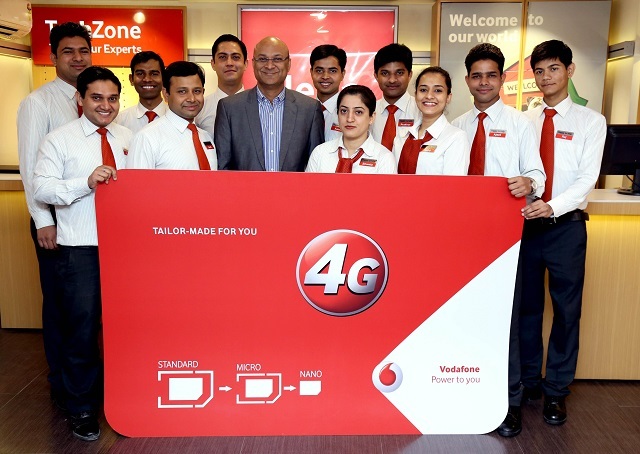 As such the operator is offering 4G SIM cards to all its existing subscribers at its exclusive Vodafone stores located at prominent locations in and around Delhi and NCR. Once the 4G services are rolled out, customers can experience the services on their 4G handset using the new 4G SIM cards and would get 1 GB of 4G data for free. To get the new 4G-Ready SIM card, Vodafone customers can walk into any nearby Vodafone store and place a request for a 4G SIM card. After proper identification process and 4G enabled handset compatibility check, you will receive the new 4G-SIM card. To activate the new SIM, SMS ‘SIMEX <your 19-20 digit new 4G SIM card number>’ to 55199. On receiving the response send the last 6 digits of the new SIM number to 55199 within 2 hours. The SIM would then be activated.